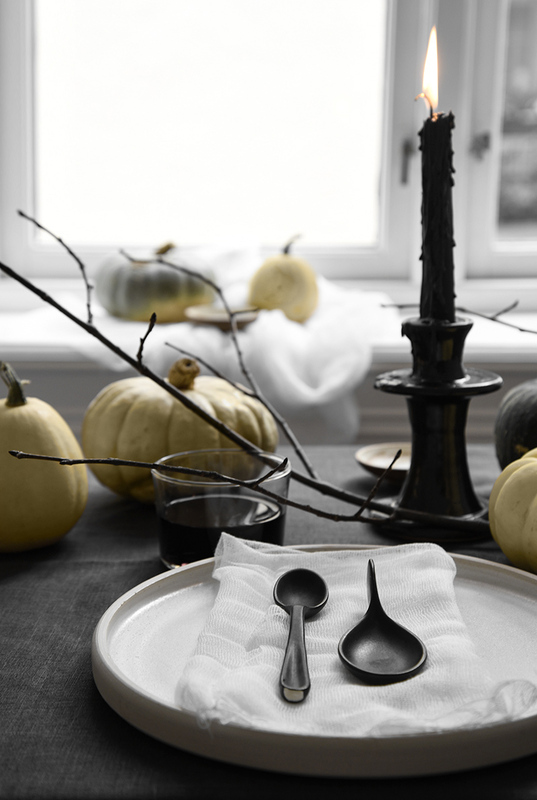 For this years Halloween table, I wanted something that would feel elegantly creepy, with a few muted color touches. 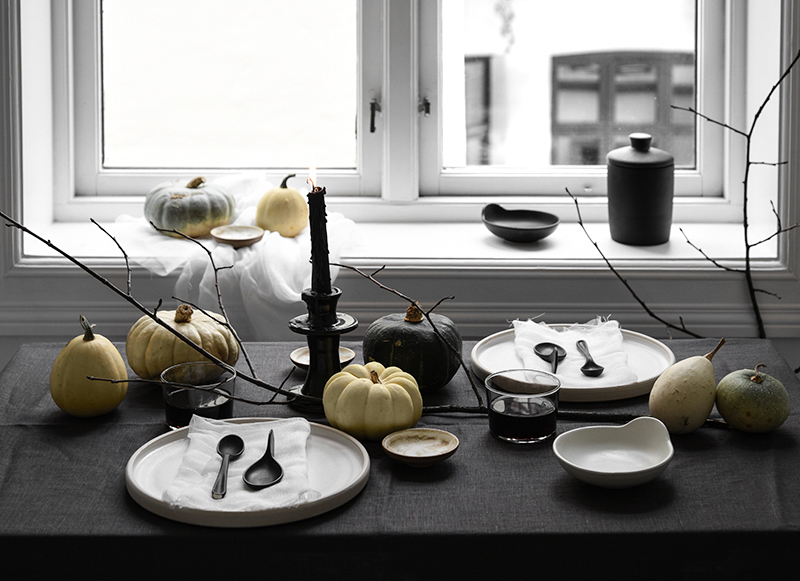 Today I will show you a sample of how I imagined my table to look like, of course you can always add or remove props depending on how full or minimal you want your Halloween table to be. Lets start! 1. A spindly branch :: Choose a skinny branch with twigs that pop out reminiscing of a strange bonny hand. If there are leaves remove them , and if the branch is not dark enough you can always spray paint it black! 2. Small multi colored pumpkins :: Here there are many choices, but try to find small pumpkins that their colors are a little faded. You can always spray paint them of course but it is best for this look if they are natural colored. I am not a fan of orange so I chose soft green, yellow and pale blush pink hues. 3. 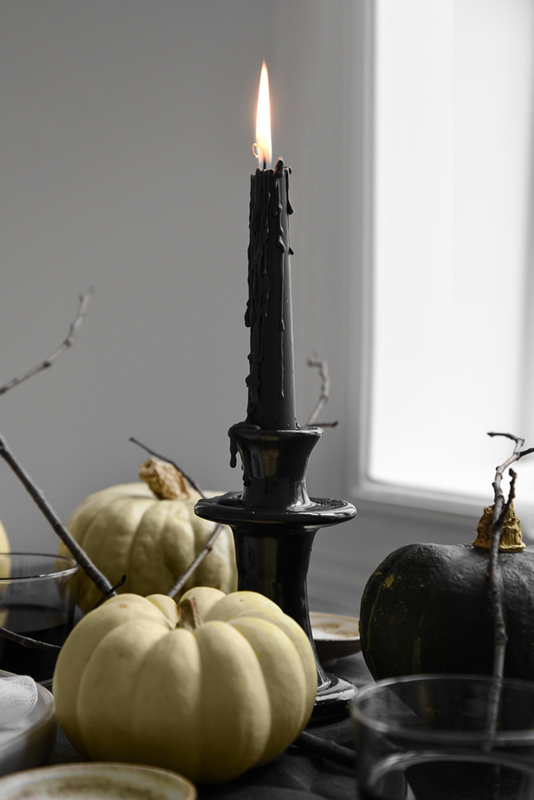 Very drippy black candles :: All you need is a candleholder that will allow the candle to drip on it in a natural way, as if it was standing by a breezy window. I found the perfect black one at Ellos on their Candleholders category. 4. 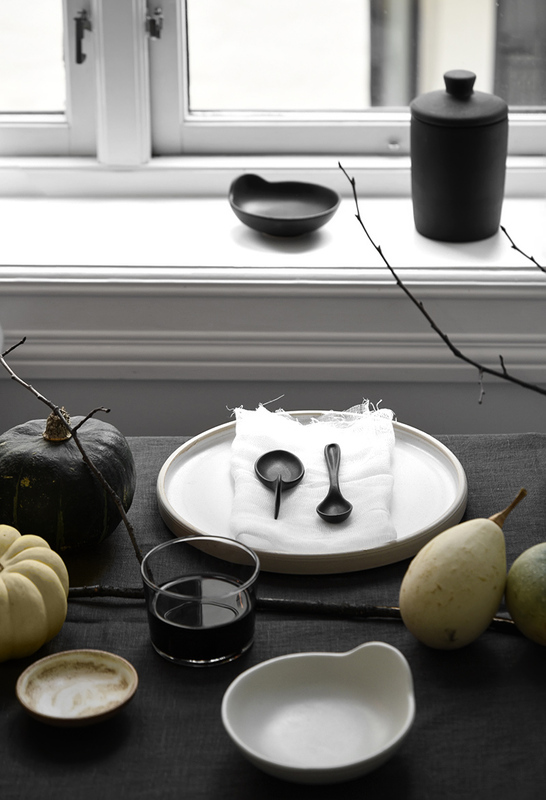 A few dark touches :: Here we can finally add something that a lot of people might be looking for for a Halloween table, I chose to use a dark linen tablecloth and ceramic cutlery against ceramic light plates while for napkins I used an organic cotton for Nuno felt piece that I cut into squares and placed under the cutlery. It gave a light touch while at the same time its light weave resembles a fine spider web, which fits perfectly with the theme! 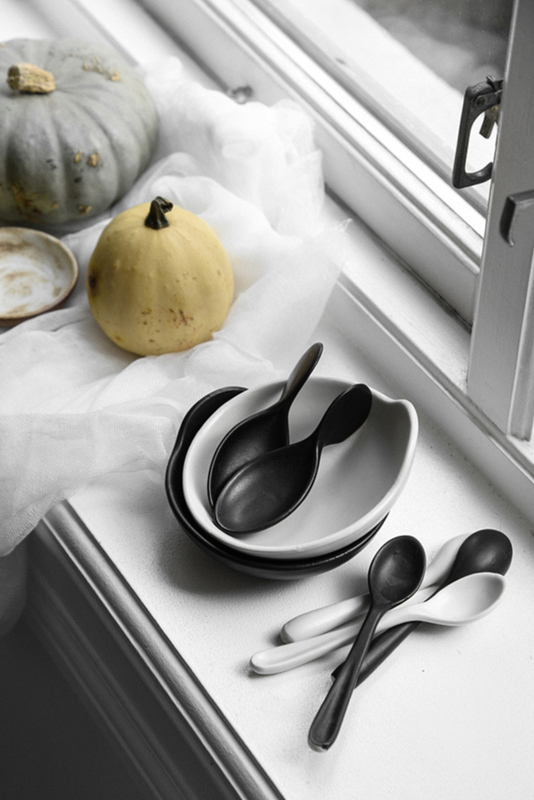 The black ceramic cutlery can be found at Ellos, from the line Mimou Pure, which also has the small black and white small bowls I used as decoration but also as side plates. 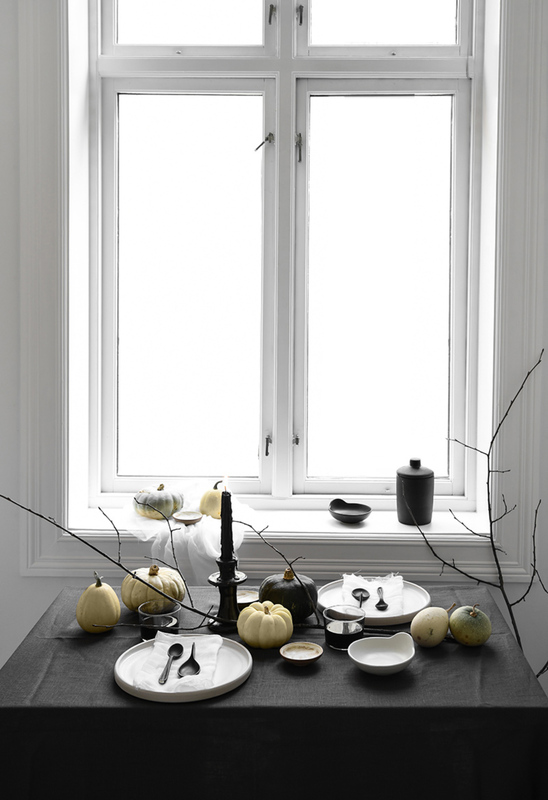 The tablecloth is from the Ellos Home line and can be found here, color dark grey. 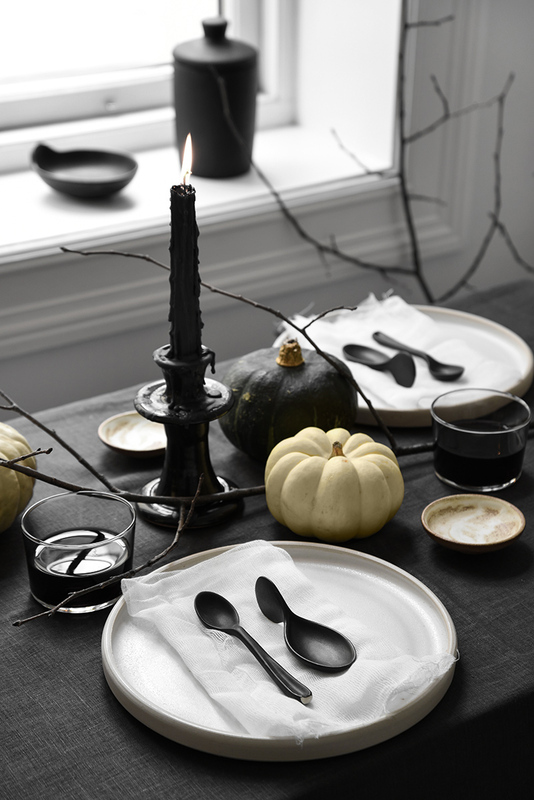 Add some more touches, like wine if you drink or an extra candle or pumpkins on the window, another branch on the floor, and this years Halloween elegantly creepy table is set!